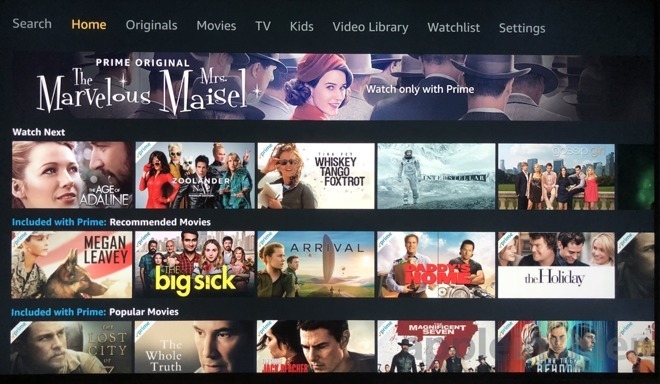 Though owners of an ultra-high definition 4K TV set with high-dynamic range will get full visual fidelity from Amazon's newly released Prime Video app for Apple TV, the sound quality won't match that best-in-class experience, as it is apparently limited to 2.1 channels at launch. Tests conducted by AppleInsider corroborate separate reports indicating that audio on the new Amazon Prime Video app is limited to 2.1 —the first digit for a pair of speakers, and the second for a subwoofer. That's well below the basic 5.1 standard —five speakers, one subwoofer — for modern high-definition content. Even the most basic surround sound configurations include three front speakers and two side speakers for an immersive, 360-degree audio experience. Yet as of Wednesday's launch on the tvOS App Store, Amazon Prime Video only broadcasts in stereo, even for content specifically listed as 5.1. More advanced home theater setups have 7.1 speaker arrays and beyond—technology more likely to be adopted by consumers who embrace advanced video like 4K and HDR. Accordingly, both the Apple TV 4K and its predecessor support up to Dolby Digital Plus 7.1 surround sound. Notably, the Amazon Prime Video app does support both 4K and HDR. The app itself spotlights "Ultra HD 4K" content available to stream, and swiping down on the Siri remote while watching a video will show if the program is in HDR. Conversely, AppleInsider verified on Wednesday that 5.1-capable content on a first-generation Amazon Fire TV does, in fact, broadcast sound on the full assortment of speakers when provided, unlike the tvOS app. Given that Amazon Prime Video for Apple TV supports advanced standards like 4K and HDR at launch, it's possible that the limitation to vastly outdated 2.1 audio is attributable to a bug in the new software. 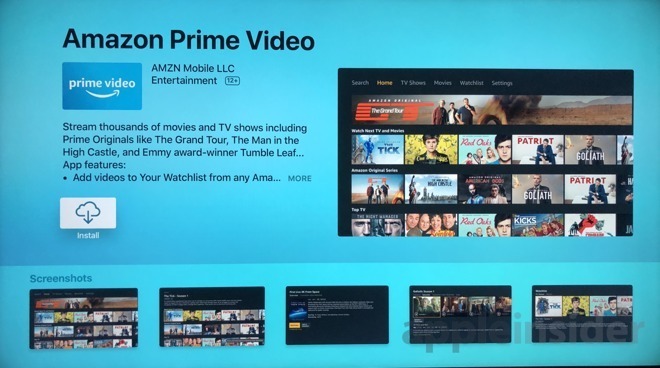 The debut of Amazon Prime Video for Apple TV was highly anticipated, as it marks the first time users can browse and stream original content from the online retailer on Apple's set-top box. Popular programs produced by Amazon include "The Grand Tour," "Catastrophe," and "The Man in the High Castle," as well as acclaimed films like "Manchester by the Sea" and "The Big Sick."